This spacious 3 bedroom home is a great retreat combining nearness to New Buffalo and the seclusion of a small, forested neighborhood. The first floor's open floor plan provides a spacious common area for dining and relaxing. A screened-in porch off the kitchen offers an opportunity for quiet, al fresco dining. 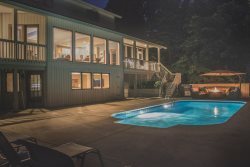 A hot tub just off the back deck and fire pit give plenty of options for enjoying the beautiful Michigan summer. The second floor hosts a roomy master bedroom with an en suite master bathroom. The master bath contains both a stand up shower and a jetted tub. A queen bedroom and a 4-bed bunk room ensure arrangements for the entire family. Whether escaping to Michigan with a full itinerary of fun activities or in search of a more relaxed enjoyment of a lake country summer, Morning Glory provides a well-suited place to unpack your bags.